There are certain products that are inherently difficult to sieve, for example, metal and pharmaceutical powders. When these products are small in particle size and/or have a sticky nature then the material can build up on the mesh wires and mesh blinding (clogging) can occur. This can be particularly prominent on meshes with small mesh apertures (openings). This can result in product build up which could comprise product quality and throughput. To overcome mesh blinding the patented Vibrasonic® Deblinding System (VDS), eliminates the blinding and blocking of mesh. Russell Finex has 2 different ultrasonic mesh systems. The BX system which consists of a self supported screen and velocity transfer plate (VTP), providing even activity throughout the screen while also providing a solid connection for the probe. The Spiroscreen™ is especially suited to larger diameter mesh frames and ensures maximum capacities are achieved on screens up to 2m in diameter. 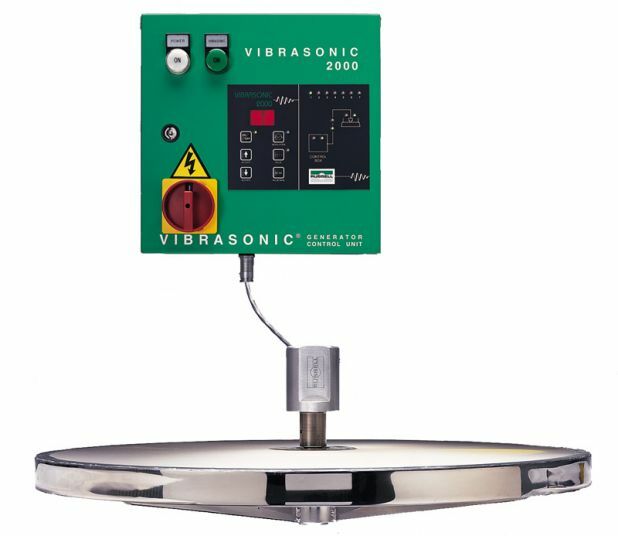 The Vibrasonic® Deblinding System can be retrofitted to all vibratory sieves. See a video of an ultrasonic screener separating Copper/Zing Alloys and contact us to find out how Vibrasonic® Deblinding System can help you increase your production throughput.